Before trucking the kids around town, parents need to make sure their vehicles are operating safely. These quick tips will help ensure your vehicle is ready to keep up with the kids’ busy schedules. From Jiffylube.com. Take the vehicle in for routine maintenance. A Jiffy Lube Signature Service® Oil Change is a smart first step to prepare your vehicle for back-to-school driving. Your vehicle’s engine will likely be working overtime since most carpools require quick trips in heavily trafficked areas. Changing your engine oil, replacing dirty air filters and checking your tire pressure are all important to keep your vehicle on the road, not on the side of it. Buckle up and make sure your passengers do too. Seat belt use among high school students is lower than among other occupants in passenger vehicles. According to a survey from the Insurance Institute for Highway Safety, many teens aren’t buckling up, even when adults are driving with them and using belts themselves. Teens often follow by example. The study reported that more than half of teens were more likely to buckle up if the adult who dropped them off at school also wore a seat belt. However, when adult drivers did not use seat belts, only 8% of teens used theirs. Practice proper car seat safety. Some mothers will be taking preschool children along when they drive older children to and from school. Make sure everyone is using proper seat restraints at all times. For infants (from birth to one year and less than 20 lbs. ), the National Highway Traffic Safety Administration recommends infant-only or rear-facing convertible seats with harness straps at or below shoulder level. The NHTSA says toddlers (over one year and between 20 to 40 lbs.) should be placed in convertible/forward-facing seats with harness straps at or above shoulders. For young children (four to eight years old and more than 40 lbs. ), the organization recommends a forward-facing, belt positioning booster seat with the lap belt fitting low and tight across the lap/upper thigh area and the shoulder belt snug across the chest and shoulder. All children aged 12 and under should ride in the back seat. Be prepared for fall showers. There may be times when you have to make the ride to or from school in a heavy downpour. As part of a Jiffy Lube Signature Service® Oil Change, a technician can check the status of your windshield wipers and tire tread. You want to make sure wipers glide smoothly across the windshield without streaking and you’re getting enough tire traction on a slippery road. Talk to your children about where they walk outside of schools. Tell them to always use school crosswalks and sidewalks and be alert at all times. According to the Safe Routes to Schools organization, of the leading types of youth pedestrian crashes, 33% are due to dart-outs — entering traffic mid-block, often between parked cars. Obey school zone speed limits. Children may not always stay on the sidewalk or within crosswalk lines, so you need to be extra careful. 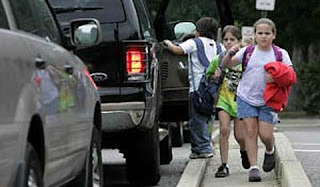 As a lot of morning traffic is comprised of parents driving children to school, so you should also watch out for other vehicles slowing down or suddenly stopping to let children out.